Saturday had only a small number of members turn up for busy bee but the weather would have had something to do with that it didn’t stop raining all day. Saturday night we had beef -pork and gravy mmmmm for the evening meal prepared by our resident chef Barb’s Brady. Sunday we woke to clear skies and the 35 riders that turned up had a great ride on a perfectly prepared track by Narrogin legend Sir Frank Barron. Racing for the day was A – B – C- old farts – sidecars and the feature was British bikes. A grade had Rod Gilchrest, Gary Johnson and young modern motocross champ Mitchell Taylor fighting for the win with the young gun coming out on top and showing us old guys how to ride whether riding a right or left hand gear change. B grade had Mike Godbold – Paul Jones – Steve Brown slugging it out for the lead, C grade had new comer Mat Ferguson showing everybody a clean pair of heels in the first race getting him bumped up to B grade straight away.For the rest of the day Bill Bartell showed he wants to move up to B grade as well by putting in some fast laps and took out the remaining races with Martin Hornby close on his tail. Over 55’s saw Steve Hansen, Ron Chandler on the very bright yellow Honda XL and Frank Barron battling it out all day. It is good to see these really old guys leaving they walking frames behind and having a go. Sidecars had only 3 teams turn up but they put on a great display with Andrew Irving – Hays Forsyth team battling out with the Dillon teams of Sarah and Robert with Hannah and Jason on the other cart, the racing was close all day. 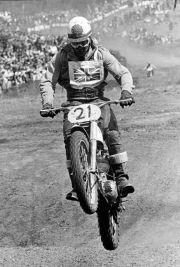 In the British bike race Mitchell Taylor – Rod Gilchrist and Lew White went toe to toe until young Taylor worked out the gear change and away he went. Everybody had a fantastic weekend and we are all looking forward to Boddington with the feature for the day 125 – 2 stroke/ 250 – 4 stroke races.